This is no time for Wisconsin to abandon the Common Core education standards, according to Howard Fuller, former superintendent of Milwaukee Public Schools. The controversial standards have become a hot-button issue in Wisconsin and around the country. Gov. Scott Walker called upon the state legislature in July to repeal the standards. In voicing his support, Fuller said Common Core could potentially play an important role in education reform. Democrats are more supportive of Common Core than Republicans in Wisconsin. According to a recent Marquette University Law School poll, 65 percent of Wisconsin Democrats favor the standards and 22 percent oppose them. Republicans are split evenly, with 41 percent supporting Common Core and an equal proportion in opposition. Walker’s Democratic opponent for governor, Mary Burke, favors Common Core. The standards are intended to improve American education by defining what students should have learned and be able to do at the end of each grade level in K-12. Common Core was adopted by Wisconsin in 2009 after being developed with extensive input from educators around the country. Wisconsin participants included teachers and principals, along with the Wisconsin State Reading Association, the Wisconsin Mathematics Council and the University of Wisconsin System. 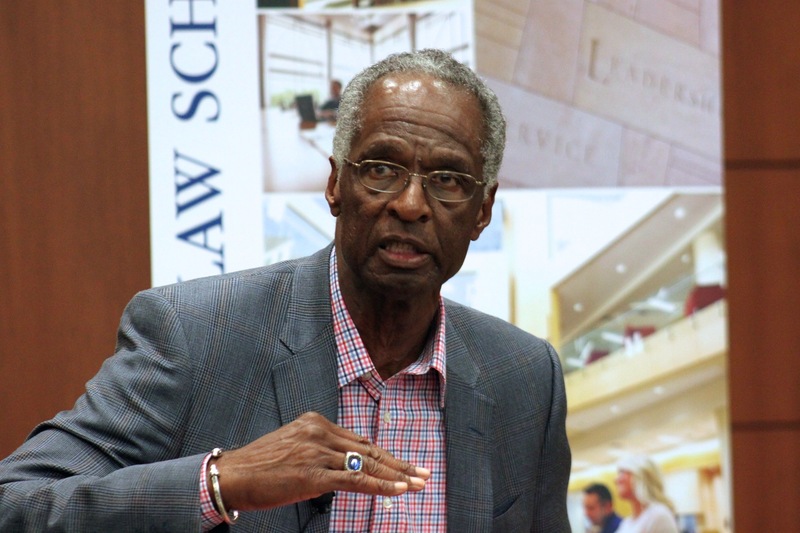 Fuller, 73, recently spoke to a full house at Marquette University about his new autobiography, “No Struggle No Progress: A Warrior’s Life from Black Power to Education Reform,” which chronicles his upbringing in Milwaukee and his personal development and professional career as an education reformer. An early and vocal proponent of school vouchers, Fuller said the future of education rests on school choice and a system that’s equally supportive of charter, public and private schools. Fuller believes each option has its role and unique strengths. Fuller believes education in Milwaukee is in a state of crisis and urged immediate action on the part of educators, government and community members. Everyone with the ability to help should participate in education reform at this most challenging time, according to Fuller. Fuller has held many leadership roles. Though not all his efforts have been successful or within the mainstream of American politics and society, he said, each helped shape his views on education reform. At various times in his life Fuller has been in the streets as a protest leader, in Africa as a freedom fighter and in Madison as a government official serving as secretary of the Department of Employment Relations from 1983 to 1986 when Tony Earl was governor. The book tells of a time in 1969 when Fuller helped launch a revolutionary black university in Durham, N.C. The Malcolm X Liberation University was short lived, but the experience taught him much about what one person can accomplish, Fuller told the audience at Marquette, which included young activists and community organizers. Much of Fuller’s time today is spent working with the Milwaukee Collegiate Academy, 4030 N. 29th St. He is chair of the board of directors and a co-founder of the academy, a public charter high school focused on preparing students for higher education. don’t have a clue what Common Core is all about. So I stand behind the teachers who are in the class rooms everyday with our children not big business who don’t have a clue how to teach our children. Our children should not be sold to Common Core.